Pittsburgh and Rochester have the best housing affordability among 91 major markets (metropolitan areas with more than 1,000,000 population) in eight nations. Both have a median house price that is 2.6 times the median household income, a measure called the Median Multiple. This is the conclusion of the 15th Annual Demographia International Housing Affordability Survey, which rates housing markets based on estimates from the 3rd quarter of 2018. Seven other major markets in the Survey are rated as affordable (Figure 1), with Median Multiples of 3.0 or less. They include Oklahoma City (2.7), Buffalo, Cincinnati, OH-IN-KY, Cleveland, and St. Louis, MO-IL, at 2.8, Indianapolis at 2.9, and Detroit at 3.0 (Figure 2). While households in affordable markets can buy middle-income houses for the equivalent of three years or less of gross median income, households in some other markets need from 10 years to over 20 years income to pay for their houses (Hong Kong, Vancouver, and Sydney). 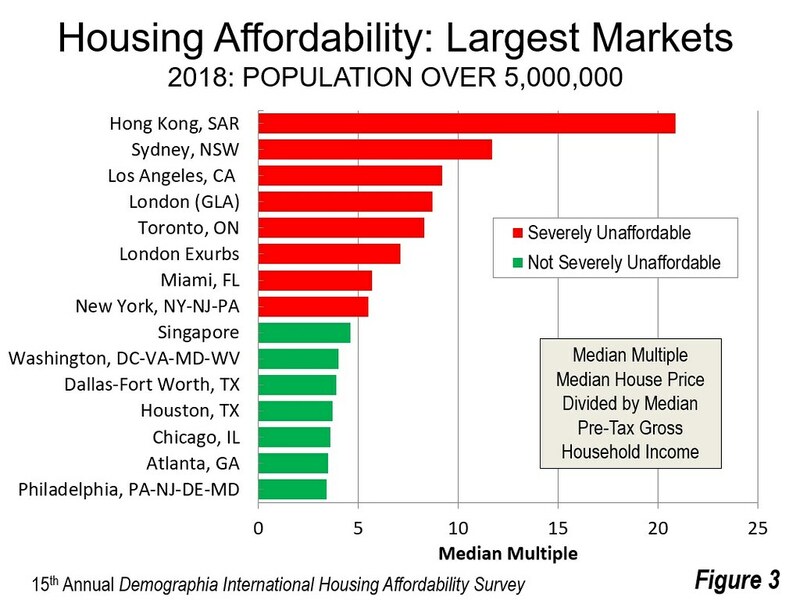 For the ninth year in a row, the Demographia International Housing Affordability Survey shows Hong Kong to be the least affordable major housing market. Hong Kong's Median Multiple is 20.9, up from 19.4 last year. This is the highest Median Multiple in the Survey’s 15-year history. 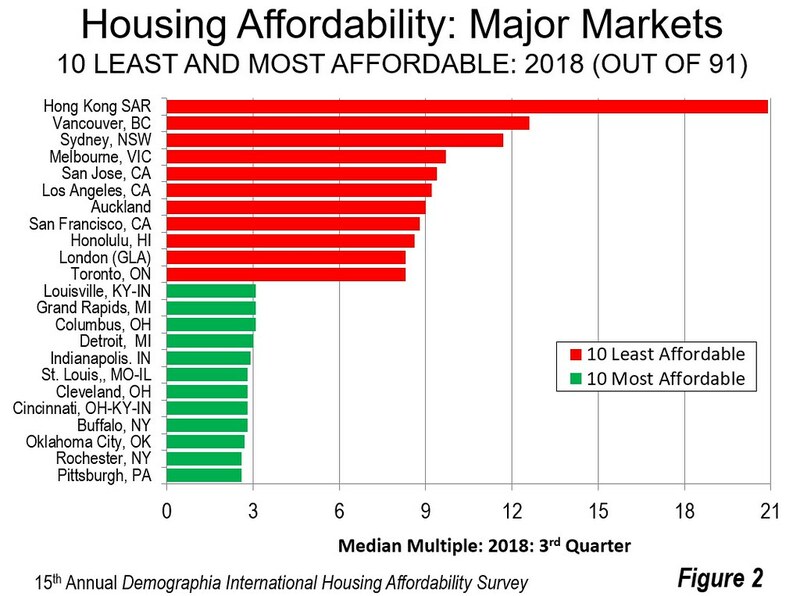 In addition to the very large markets noted above, the least affordable 10 includes Vancouver, which at 12.6 the third second least affordable major market, retaking that position from Sydney, after four years. Melbourne had a Median Multiple of 9.7, followed by San Jose (9.4), Los Angeles (9.2) and Auckland (9.0). The balance of the least affordable 10 included San Francisco (8.8), Honolulu (8.6) along with London (Greater London Authority) and Toronto, both at 8.3. There are 29 severely unaffordable markets, which are shown in Figure 4. These include all major markets in Australia (5) and New Zealand (1). Two of Canada's six major metropolitan areas and six of the United Kingdom's 21 major markets, including London and the London Exurbs. There are 13 severely unaffordable markets is in the United States. This represents, however, less than one-quarter of its 54 rated markets. Among the 309 markets of all sizes in the Survey, 79 are severely unaffordable, with 28 in the United States (out of 188), 16 in Australia (out of 23), 17 in Canada (out of 50), 11 in the United Kingdom (out of 33) and six in New Zealand (out of eight). There are no severely unaffordable markets in Ireland or Singapore. There are also 62 affordable markets (Median Multiple of 3.0 and less --- 49 in the United States, 11 in Canada, two in Ireland and one in Australia. There are no severely unaffordable markets in Ireland or Singapore. Canada’s Cape Breton, NS is the most affordable of the 309 markets, with a Median Multiple of 2.1. In the book, he blames “the lack of interaction” between urban planning and urban economics” for the “serious dysfunction in the development of cities,” and calls for incorporation of economics into urban policy. Berthoud elevates the issue of housing affordability to its genuine significance, suggesting that: The main objective of the planner should be to maintain mobility and housing affordability. Obviously, mobility is important because of the need for people to reach work in metropolitan areas (see: “Employment Access in US Metropolitan Areas”). 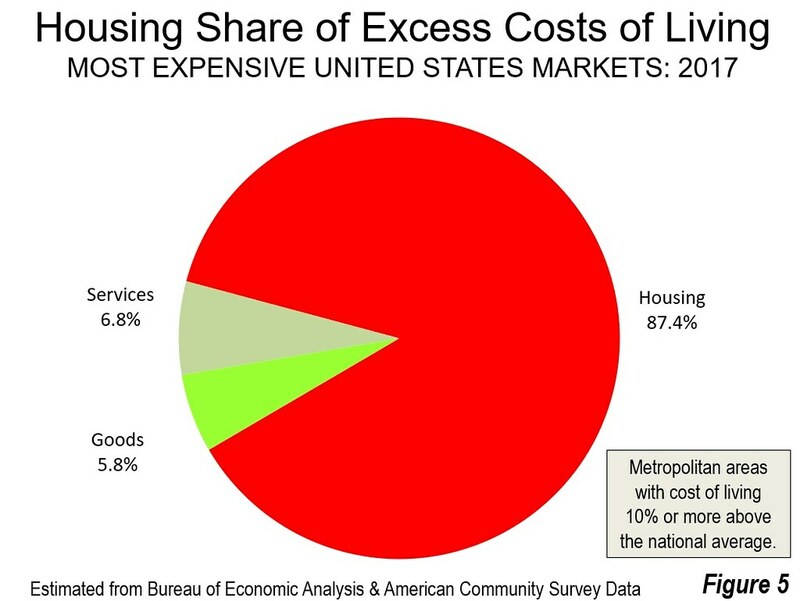 Housing affordability drives the cost of living. Nearly all the cost difference between high cost metropolitan areas and the national average is the difference in housing costs (Figure 5). Myth #1: planners know how to allocate land equitably through the design of increasingly complex zoning regulations while ignoring price signals. The mindsets resulting from these myths have dire consequences. Middle-income households are increasingly unable to afford middle-income housing, because their prices have been driven up by excessive regulation. More households are added to the queue for subsidized housing, as they can no longer afford the market rate housing that has increased so much in price. With this demand, induced by excessive regulation, its governments typically have long waiting lists for subsidized housing. It is not surprising that homelessness is increasing in this environment. When people must pay more for housing relative to their incomes, they have less for other goods and services. This explains how California, home to some of the world’s greatest wealth, is also home to the highest poverty rate among the 50 states when housing costs are considered. Finally, in “Avoiding Dubious Urban Policies,” Berthoud characterizes the Demographia Survey message to be that unaffordable housing is not an unavoidable fatality linked to economic success. We have not said it better before.